The Institute of Oceanology Polish Academy of Sciences, Sopot; the Technological University of Gdańsk, the Maritime Institute in Gdansk and the Institute of Technology and life Sciences in Falenty will cooperate, exchange knowledge and good practices in order to provide tools for the Puck District that will enable to improve the surface water, groundwater, seawater condition for recent users such as e.g. farmers, fishermen, tourists and future society. The Bay of Puck, southern Baltic Sea is an example of a region that is highly vulnerable to anthropogenic impact. The strategic actions and the policy of the authority of the Puck District regarding the environmental protection involve not only the respect of the Natura 2000 legislation but also realisation international commitment of our country made to the European Union and European legislation. The main aims of the Puck District policy are improvement of the environment, sustainable development, refrain from climate change and protection of the natural resources such as water. The most significant sources of pollution such as nutrients and pesticides fluxes for the Bay of Puck environment are agriculture and surface structure. Knowledge upon the nutrients and pesticides distribution in the proposed study site and their discharge to the Bay of Puck is limited. 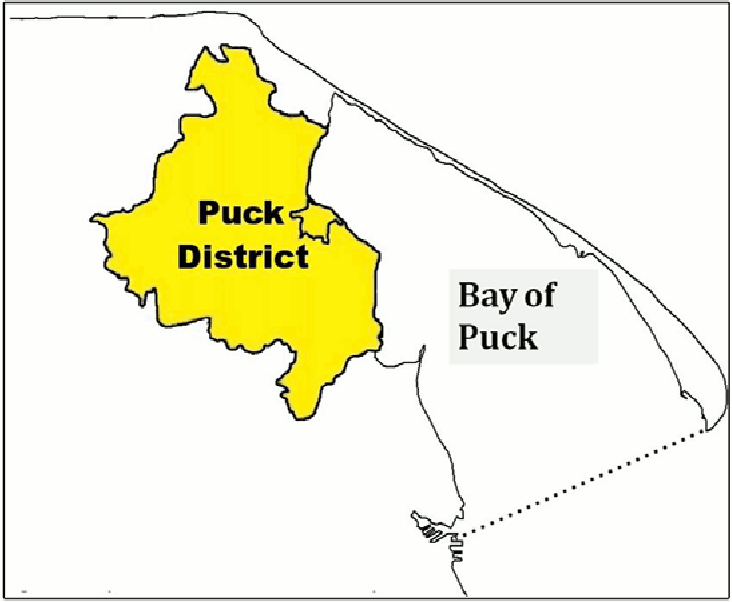 Therefore, the project will be focused on determination of the current and future environmental status of the surface water and groundwater located in the Puck District and its impact on the Bay of Puck environment. Previous research experiences show that it is necessary to develop a comprehensive approach towards the description of nutrient and pesticide cycling in different compartments of the environment (soil, groundwater, inland surface water, sea). Therefore, there is a need for integration of models for flow and contaminant transport with GIS tools in order to better characterize the topography, land use and enable better environment management and protection. 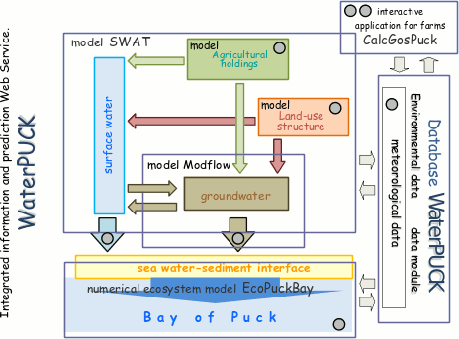 To develop WaterPUCK service the best currently available models, applications and calculation fluxes will be integrated (see Figure). The service will include surface water model based on SWAT, groundwater flow model based on Modflow, 3D environmental model of the Bay of Puck based on the POP code and integrated agriculture calculator called "CalcGosPuck". The major goal WaterPUCK is to foster improvement of natural environment as well as development of regional and national economy. Identification of main mechanisms responsible for the transport of pollutants in surface and ground waters, will allow the application in practical commercial solutions, due to innovating approach and methodology of industrial and development research. The project aims realisation will contribute to the main objective of the BIOSTRATEG III Programme "Natural environment, agriculture and forestry" devoted to the Problem Area I "Rational management of natural resources with special regard to water management".